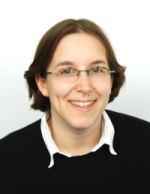 Petra Isenberg (petra.isenberg@inria.fr) is a research scientist (CR) at Inria, Saclay, France in the Aviz research group. Prior to joining Inria, she received her PhD from the University of Calgary in 2010 working with Sheelagh Carpendale on collaborative information visualization. Petra also holds a Diplom-engineer degree in Computational Visualistics from the University of Magdeburg. Her main research areas are information visualization and visual analytics with a focus on off-desktop data analysis, interaction, and evaluation. She is particularly interested in exploring how people can most effectively work together when analyzing large and complex data sets on novel display technology such as small touch-screens, wall displays, or tabletops. Petra is associate editor-in-chief at IEEE CG&A, associate editor of the IEEE Transactions on Visualization and Computer Graphics, has served on many organizing committee roles at IEEE VIS including as papers co-chair for Information Visualization (InfoVis), and has been the co-chair of the biennial Beliv workshop since 2012.